And buyers will benefit. Here's how. The Mazda MX-5 Miata is the best-selling sports car of all time, with more than 1 million units sold since it first hit the market in 1989. Not bad for a little two-seat niche roadster. But it appears that last year Mazda overestimated the car’s popularity somewhat by building too many of them. As a result, it needs to sell them fast in order to free up space on dealership lots. 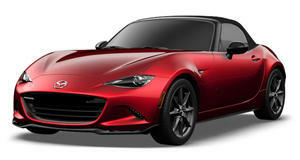 According to CarsDirect, beginning this month Mazda is offering some sweet incentives on all remaining 2016 MX-5s. Here’s what’s on offer: Starting this past week until May 1, the Japanese automaker is offering a $1,500 bonus in western US states, like California, on all 2016 MX5s. If you don’t live out west, then it’s still worth the effort to bargain down the price, armed with the knowledge that Mazda is in kind of a bind here. The new 2017 MX-5 Miata RF, which is just hitting showrooms, is the likely culprit in hurting remaining ’16 model year sales. But what if you’re a current MX-5 Miata owner and were only pondering the idea of snagging up a new one? Also a good time to do that because Mazda is offering a $500 loyalty bonus. So if you live out west, you could save up to $2,000 right now – and that’s even before any bargaining on your part. Rarely does Mazda have such deals on the MX-5, and don’t expect to see them this time next year on the RF, considering how popular it is so far. Interested buyers ought to jump at the chance right now.